The media finally got a tour of Elon Musk’s plan to revolutionize transportation in Los Angeles — and it didn’t go well for Musk. Musk had promised modified “but fully autonomous” vehicles at the unveiling, but the reality was more modest: a Tesla Model X that reached a top speed of 53 mph, manually driven by an employee who previously drove in the Indianapolis 500. The trip through the tunnel took about two minutes, illuminated by the car’s headlights and a strip of blue neon lights tacked to the ceiling. The Model X rolled on two molded concrete shelves along the wall, which were so uneven in places that it felt like riding on a dirt road. 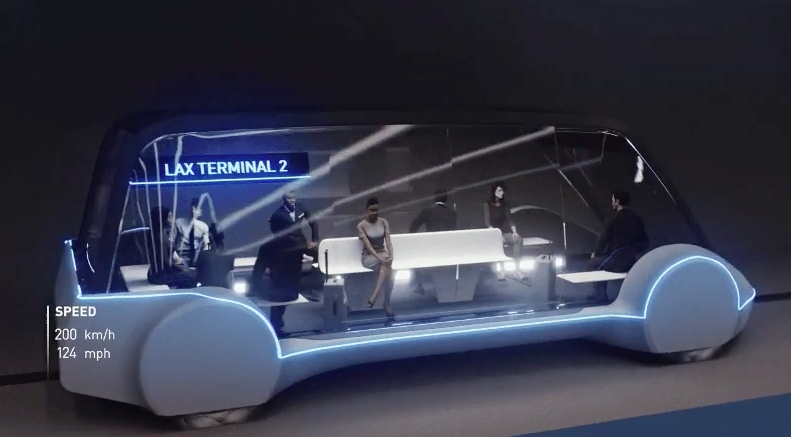 The Boring Company still insists the tunnel could become part of a network that will be filled with self-driving cars that will race people in groups through L.A. at speeds of up to 130 miles per hour. But the company is also hedging. Earlier this week, it told Nelson that the tunnel is just an R&D for the Boring Company, which Musk says is aimed at revolutionizing the tunneling industry, one of the most complicated endeavors in civil engineering. It’s probably good that the company has offered an alternative explanation for the tunneling, because the whole concept of developing an underground road network is flawed. Musk’s tunnels are a lot like a subway, but with carrying capacity reduced to practically nothing. Elizabeth Lopatto, a reporter with the tech publication, the Verge, wrote that Musk’s original plans were very much like a subway. Musk said the tunnel would carry “pods” with 16-20 people. But reporters arrived to find out plans have apparently changed from a public transit system to a private system for rich drivers. It does seem strange, though, that we’re taking this ride in a Model X — because until this evening, there were going to be “autonomous electric skates” that zip passengers around at 120 to 150 miles per hour. These skates were supposed to carry eight to 16 people in a pod or a single car. Unlike with a more conventional subway, these skates don’t stop between where a person gets on and where they might get off; every skate runs express to one’s final destination. Anyway, the skates have been canceled. “The car is the skate,” Musk says. The rollout was almost universally panned on social media and in the wider news media. It’s a Disneyland tram ride at best. Some experts questioned whether the Boring Company had even succeeded at improving the cost of tunnel boring. Right now, it’s not altogether clear that it did. The cost of the tunnel is low because the tunnel is small. You need dozens of tunnels for non-stop A to B trips (and to solve for the “red herring” of induced demand what). At what point does the tunnel of tunnels reach the mines of Moria and the cost point of an actual subway? 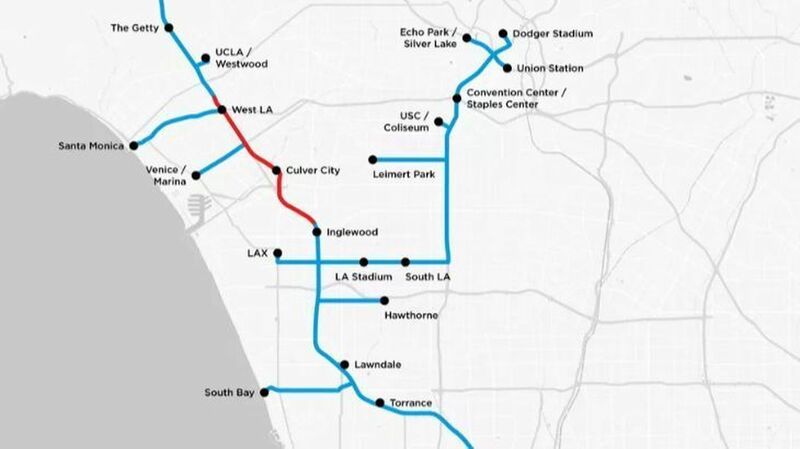 Nevertheless, Musk told the LA Times he plans to continue with a 3.5-mile tunnel between a Red Line transit station and Dodger Stadium. And he hopes to have the whole system built out in time for the Olympics in 2028. But raising the money, building political support and receiving environmental permits would be a staggering undertaking, says Scott Frazier of LA Podcast. He noted that the Boring Company abandoned plans to build a tunnel through the Sepulveda Pass — which cuts through a mountain range between West L.A. and the San Fernando Valley — after learning it would be subject to a full environmental review process. But even if the political and financial obstacles could be overcome, the biggest problem is the issue of access and geometry. L.A.’s highways are congested. Simply putting new ones underground doesn’t really solve this problem. Perhaps autonomous vehicles could travel up to 130 miles per hour in underground tunnels, but there’s still a big problem: How to get all the cars down there. Musk claims that self-driving cars will enter the tunnels via a special elevator inside a parking garage. But this design creates congestion at the front end while promising to relieve it on the journey. Drivers will need to line up to wait their turn on the elevator. If the tunnels were really able to deliver lightning fast commutes across Los Angeles, demand would likely be quite high. One way to manage demand would be pricing. Musk has never explained what he would charge to use one of his private underground highways. But he would likely need to charge exorbitantly high rates to keep the tunnels and elevators flowing smoothly. A full build out of the concept could end up being a private uncontested highway system mirroring the congested public one for use only by a very rich few. Hopefully, Tuesday’s press event will put the whole idea to rest. It’s easy to hate on people’s new ideas, but since this doesn’t cost any public money and doesn’t really seem to be doing any harm, why not let Musk build all the tunnels he wants and try to solve the various problems that entails. Maybe in the end something awesome results which we all benefit in. Maybe he will have wasted some investor money. Since there is a potential upside and it is at no cost to me why shouldn’t I support what he is trying to do? The difference is in a subway you have one vehicle with a thousand people aboard and on the Muskway you have one vehicle with one person. It is much more likely that one of Musk’s Muskmobiles will break down when they are far more of them moving around in the system. But if one subway train, holding a thousand people breaks down, then you still have a thousand people “trapped”, and so are the thousand people on the train behind that and so on down the line. A daily subway rider in NYC would recognize this pattern, alas. I’m not saying that Muskway is better, just that the problems are exactly the same. That’s not the right analysis. A train has maybe 10x the number of moving parts as a car while carrying 1000x more people. Not a fan of this particular idea but most of the reason new ideas don’t pan out isn’t because they’re not technically practical but because people collectively are stupid. They just can’t grasp anything much different than their present reality. Take for example the futility of trying to explain to many of the people in this country how bicycles could be a viable means of transport for more than half of typical trips. Because it doesn’t exist, they just can’t see it. Even worse, they still can’t see it even when you show them working, real-world examples of this, like in the Netherlands. You’ll get stuff like their culture is different, it can’t work here, etc. Same thing with public transit. To them an automobile is the only possible means of getting around. Anything else is seen as too alien, too different. Now take an idea which may well be possible, practical, and even fulfill a real-world need but which doesn’t currently exist. All the reaction you’ll get out of most people will be a dumb, blank stare, or possibly laughs ridiculing you as living in a fantasy world. If there’s any problem, I’d say it’s an educational system which trains people to be good, corporate drones instead of thinking human beings who can imagine possibilities past what exists. Thank goodness early man didn’t have this upbringing or we would still be living in caves and hunting woolly mammoths. My problem isn’t that it’s a new idea but rather that as others have said, he didn’t do his basic homework. He talks about low-cost tunnels, but then proposes an elevator to reach them???? Putting aside that elevators frequently break down (at least compared to ramps), they would represent a major bottleneck. I love new ideas. I think his Hyperloop is something that might actually get somewhere, but not in its present concept. Make the tunnels and tubes large enough for a conventional size train, evacuate nearly all the air, then run the thing at a few thousand mph. Figure out how to span the tubes over oceans and you’ve just replaced plane travel with something more environmentally sound, faster, probably safer, and a hell of lot more comfortable. Or if your goal is eliminating urban congestion with tunnels, think about why a little further. The ultimate goal is to enable relatively fast travel within cities. Guess what? You don’t need to go 125 mph to travel 5 to 10 miles. Bikes already travel fast enough for those short distances but they’re hampered by bad roads, cars, pedestrians, traffic controls, etc. They’re also not something a lot of people like to use when it rains or snows. So put them in a system of tunnels and you solve all those issues in one fell swoop. Use e-bikes and you have a system which can give you 20+ mph average speeds on most trips if the tunnel grid is dense enough (say one every 1/4 to 1/2 mile). That rivals subway travel speeds but without the waiting time. If you can do the tunnel network on the cheap, you’ve just created an urban rapid transit system whose primary cost is the construction cost. Once built properly, the tunnels will last for centuries. There are nearly no ongoing labor costs. The only relatively major expense is the electric to light the tunnel. With LED lights you won’t even need to replace the lights that often. Bingo, you’ve just created an urban rapid transit system, but one which anyone can use, and which really doesn’t require a fare. The operating costs are low enough to be a rounding error in the budget of large cities. I’m pretty sure you’re not being literal about the number of moving parts, right? Regardless, it doesn’t change the fact that both trains and cars get slowed down or stopped while traveling in tunnels. In neither case is that as dire as some here would make it out to be. I can’t say I share your enthusiasm about riding my bike through a long, long tunnel. In any case, your suggestion reflects what a lot of people are pushing for here: they want more road space for their preferred mode of transportation, be it bicycles, buses or subways. Musk want the tunnels for his super-futuristic cars. Personally, if more tunnels means that car drivers spend their travel time underground and I get a high-quality bike lane, hey, win-win, right? The tunnels are just a way of adding capacity. Not exactly a revolution in technology, but hardly a miserable failure, either. To some extent you’re right, and the only thing which might be truly revolutionary is if Musk develops a very low-cost method to build tunnels. The concept of using grade separation, which is all tunnels really are, to get more space is probably as old as cities. To date though we just haven’t used it to any great extent (besides highways and subways) because of the costs. If I had to make a city from scratch, each disparate mode would have its own level. Personally, if more tunnels means that car drivers spend their travel time underground and I get a high-quality bike lane, hey, win-win, right? True but I’m considering costs and engineering realities. You can probably fit 100 bikes at low speed in the same space a car moving at 125 mph would require. And that basically points to the flaw in all this. The constraint is really the number of vehicles per hour. The logical way to move more people per hour is to make the vehicles smaller and/or slower (slower vehicles need less separation), or to increase the capacity of each vehicle. When you take these things to their logical extremes the idea is most feasible if the tunnels carry either bikes or trains. …a second tunnel for return traffic. you slam him but still you didn’t even watch the presentation, he in fact does show ramps and corkscrew ramps as other ways to reach the tunnel. The vision he has is that there will be many elevators, it’s not a bottleneck if there are dozens of entry points. I understand your position, however the stakes are too high for a thought leader to be driving the conversation to places which stall out the ambition for delivering proven solutions. He is the wealthy ‘abstinence advocate’ to fight HIV. The ‘it’s worth a shot, and it’s his own money’ attitude, which goes against the advice of all experts in the field, costs lives and confuses the issue. There is nothing revolutionary about making an electric car (electric cars have been around for 100+ years). He took billions of dollars and made them better than anyone without turning a profit… God for him. He took his billions in hand outs and did what he was supposed to. Many before him could have made some cool stuff with billions of free dollars without having to worry about profitability for a long time. His rocket company is just another me too project. It’s been done nothing revolutionary. What Musk is best at is ripping off tax payers to fund fancy coal powered cars with very low energy density. Yes they are powered by coal to a large extent which charges the batteries. What a fuking scam. And idiots still dont get what a scam he has been running. “Many” elevators adds to the cost. Then you have the problem of capacity. I doubt you’ll be able to get more than one car per second, even with automation. That’s 3600 cars per hour, most of which are likely one occupant, so 3600 people per hour. And that’s pushing it. In the real world I’d be surprised if the throughput gets into the four figures. Meanwhile 2,000 passenger subway trains on 90 second headways can move 80,000 people per hour. Given these disparities in throughput, unless the overall cost per mile is less than about 1/80th that of a subway I’m not seeing how this is economically viable. Subways have been built in places for as little as $100 million per mile. Even in first world countries they come in at $300 to $500 million per mile. Can Musk build the entire system for $2 to $6 million per mile? I doubt it. The tunnels themselves might get done that cheaply but then there’s all the rest. That isn’t to say this wouldn’t be viable with higher capacity vehicles. Unfortunately, Musk only sees the world from his windshield perspective. Narrow minded people. That’s also the problem not just traffic.. It takes time and a lot of brain power to accomplish what musk it visioning.. I agree so long as he has to follow the same regulations as other tunneling endeavors like environmental impact policies and emergency egress requirements because otherwise he will be getting an unfair advantage. That’s impressive but definitely would not work in cities with older highways, and unlikely enough room on local roads either. And how much safer are you in a small vehicle like that versus a motorcycle? If you eliminate fatalities due to speeding and intoxication, the death rate for motorcycles declines substantially. I see the parallel you are making, but I don’t think it applies here. Is his work stalling the ambition for delivering proven solutions? No. There isn’t much ambition to start with, and I’m not 100% certain that the solutions that people are offering here qualify as “proven”. In the meantime, unlike anyone else, he is showing that there might be other solutions to transportation problems that new technology can solve. Maybe not unlike anyone else: perennial Streetsblog villains Uber/Lyft/Bird/Lime have also harnessed new technology that have given a lot of people more access to new modes of transportation. If only they were acting like plucky paupers, or doing it with taxpayer dollars, maybe then they would get the approval of the Streetsblog crowd? I’ve ridden in it as a passenger in San Francisco, and it worked great. It was invented to be driven to resolve traffic congestion in Los Angeles, and I think it would dramatically prove its worth there, for sure. Since I think about it every time I’m stuck in traffic on highways and city roads in Chicago, I know it would work great here, and when I drive in Dallas, Houston, and Austin where my relatives live, I know it would work great there, too. I think there are at least ten reasons why they’re safer than a motorcycle: 1) Roof 2) Floor 3) Four wheels versus two 4) Four-point harness for driver 5) Four-point harness for passenger 6) Locks on the door to protect belongings 7) Steel bars in doors 8) Roll-cage 9) Carbon fiber outside 10) Ballasted by batteries. Further, if there’s ever any reason to believe an automated car would not be 100% safe, it’s 50% safer than a side-seated automated car because it’s 50% less likely to have a collision;. Both of the AV collisions reported in the news were hit on passenger sides. I wasn’t aware of the statistics about motorcycle fatalities. Very sad, but also very hopeful. Also cool that there will be AV motorcycles eventually which could help mitigate fatalities. If I don’t understand the problem(s), I cannot implement a successful solution. The Google founders fund Waymo and several other transportation projects. Richard Branson aligns his name, and probably funds, to Virgin Hyperloop One. Before he died, Paul Allen’s company provided $10,000,000 for the Smart Cities Challenge won by Columbus, OH. The very wealthy Knight Ridder Foundation funds transportation projects in mid-size cities where the company published newspapers. I’m envious of Musk. I’ve been posting about my favorite solution for traffic congestion, cleaning air, and offering better options for transit deserts for twelve years and only occasionally see likes and positive responses, however, it still seems like a worthwhile endeavor to me at this point. It would only take a four word tweet by Elon to completely change the conversation: “We’re manufacturing skinny cars”. He recently tweeted about different types of vehicles in the tunnels including “small cars”. To mitigate traffic on highways, roads, sidewalks, and tunnels, skinny vehicles are the best. I had forgotten about driverless cars and the hyperloop, which are also projects that elicit high levels of vitriol from the Streetsblog crowd. Mostly for not being bicycles, as far as I can tell. “doesn’t really seem to be doing any harm” – just as long as he’s not tunneling in a location where we need a subway or sewer line some day. No, it’s not that Streetsblog people just have a fetish for bicycles (though surely some do). The issue is that in urban areas, we have a limited amount of space per person, and both self-driving cars and hyperloops require much more space per person than buses, let alone trains, bicycles, or walking. Musk continues to ignore the idea of space per person, and focuses on increasing speed while decreasing capacity, or coming up with an expensive new way to increase capacity while leaving it dedicated to low-efficiency systems (like cars). Uber/Lyft/Bird/Lime aren’t villains on Streetsblog the way the automobile industry is. There is a lot of respect and excitement about them as well as some dislike. As far as Musk’s work stalling the ambition for delivering proven solutions, it’s really about Hyperloop as a vision to displace high-speed rail, but also about self-driving cars as a vision to displace light rail in other cities. Seems to me that he’s addressing your concern (limited space) by creating more space (digging tunnels) that also allow him to increase speed at the same time. Sewer lines are never that deep as they are always cut and cover excavation at the surface. Also beneath the surface is three dimensional so his tunneling doesn’t preclude future subway use. Also presumably the government could eminent domain the tunnels if they had a need. How does a single lane of tunnel perform similarly to 4 highway lanes in terms of bandwidth? I thought that both highway lanes and this tunnel were about equal to 1 person per second at the limit of throughput. Is there something I’m missing? We can agree to disagree about how vilified various actors are on Streetsblog. As for “proven solutions”, you’re citing high-speed rail and light rail, which work outside the US (often, not always), but have been dismal and expensive failures here. We can debate the “why” for each elsewhere and endlessly (my take: our geography is simply not the same, never will be). However, I truly wouldn’t fault any politician for being attracted to a privately funded Musk project over yet another bloated money pit of a HSR or light rail proposal. Sometimes that’s how progress happens. Kenny, AV and hyperloop tech could help urban areas immensely. The key is vehicle or pod width. Yes, side-seated car design is not good for space per person, but, like single-width pedaled and motored cycles, single-width, highway-capable cars exist and would be far, far better for urban roads and parking. Indeed – a short, narrow-track vehicle parked facing the curb completely eliminates bike dooring. A Streetsblog editor recently tweeted “What if cars were just shaped a lot differently is something we don’t discuss enough, IMO.” Hopefully, this will become a much more discussed topic on these boards. Elon Musk = Extra in Mike Judge’s IDIOCRACY. The footage of him sweating in front of the press with a fake smile was worth a laugh just for the sheer cringe factor. The system he envisions would possibly be the most ridiculous boondoggle ever constructed. The first accident in that tunnel might result in the deaths of thousands of people. CjStephens, you’re a breathtaking moron. 150 years ago Los Angeles was a honeycomb of private enterprise subway tunnels, all of them shut down by the State. A simple drive along La Cienega can still reveal former exits of one of the largest private enterprise subway systems in the world before the State took over everything and forced them all out of business. People like you don’t even know what they don’t know. Elon Musk is a clown and his fanbois are worse. Elon Musk is a billionaire because the U.S. government arbitrarily awarded him a billion dollars. Otherwise this guy would probably be hawking super-absorbent sponges on late night television right now. Go back to sleep, you ain’t woke and never will be. The late Roman Empire had bureaucrats with no technical acumen planning to power warships with treadmills driven by oxen. They were complete losers for whom all innovation had come to a complete halt and oxens walking on treadmills was the best they could do. They had no future and neither do you. Why not? As long as they were using their own money, what do you have against private enterprise? I think you must be positioned on the gravy train somewhere. I predict this is the last we will hear about these idiotic reefer madness tunnels and very shortly the last we will hear of Elon Musk. I probably shouldn’t engage with someone who starts out by calling a total stranger “a breathtaking moron”, but here goes: Yes, I know about LA’s streetcar heritage (“Who Killed the Electric Car?” plus “Who Framed Roger Rabbit”). What Musk is proposing sounds a lot more like that than the freeway madness that replaced it. And while I’m far from a Musk fanboy, you’re a great example of the blind hatred that I see so much of on Streetsblog. You know that Musk was a billionaire _before_ Tesla, right? Wait, so you’re _against_ innovation now? Or just against innovation by people you don’t like? Um, I’m the one arguing _in favor_ of private enterprise offering innovative solutions and pointing out that others here tend to demonize any solution that comes from the private sector. Maybe you want to delete that last post? You’re entitled to your opinion, but somehow I expect that prediction won’t age well. Really sad Elon doesn’t embrace public transportation, cause his ideas MIGHT be of use somewhere. Moving cars around just makes the whole idea fall apart. Yes he’s made alot of money on some of his ideas, doesn’t make every idea a jewel. The Boring Company should refocus on the real task here of reducing the cost of building tunnels for regular old subway cars. I enjoyed this one in Antwerp. Not every city is a big city. Some cities have 1 million people. Some have 0.4 million people. Canberra has 400,000 people, an international airport, university, rugby stadium, parliament, schools, etc. Is it viable to build a heavy train station at the rugby stadium? Or would a medium-capacity SkyTran system do? Are people more likely to use public transport if they get to sit alone in a SkyTran pod instead of having to stand in an overcrowded heavy train? A billionaire worth twice as much as Elon purchased 12.7% of SkyTran in Oct 2018. I hope it works out. Even if SkyTran is put in a tunnel, the tunnel need not be wide because the pods are very narrow. You may have read concerns about specific aspects of self-driving cars (for example the safety standards that should be required) here but hardly anyone universally condemns the tech. Hyperloop on the other hand is unproven technology. Maybe it will mature over the years and earn a place in the short list of viable transportation options. Right now it is just a distraction from creating real solutions.